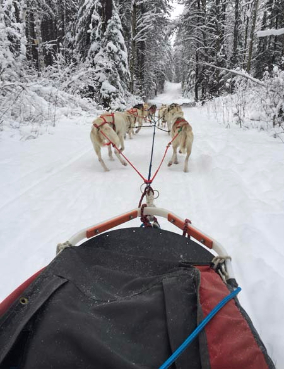 Experience the silent and beautiful world of winter in Northern Minnesota and the thrill of dog sledding with White Wolf Dog Sled Outfitters. Dog sledding is one of the fastest growing sports today. Its popularity has been spurred on by what is known as "The Last Great Race", The Iditarod, which has received national media attention to a greater degree every year. The beautiful, smiling, eager sled dogs have won the hearts of many people. The appeal of dog sledding is universal and it's an experience that leaves you with a desire to come back and do it all over again. For some, it even becomes an obsession and eventually leads to pursuing it more seriously. Whatever your reason for seeking more information, we encourage you to study our online brochure and then contact us so that we can personally give you more information about our trips, or just to chat about this wonderful way to experience the beauty of winter from atop the runners of a sled powered by an eager team of sled dogs. Check out some videos from our guests and friends!